Child with autism symptoms Dubai: The ADOS-2 provides a highly accurate picture of current symptoms of autism, unaffected by language. It can be used to evaluate almost anyone suspected of having ASD from one-year-olds with no speech, to adults who are verbally fluent. It is considered the gold International Standard for diagnosis of Autism Spectrum Disorders (ASD). 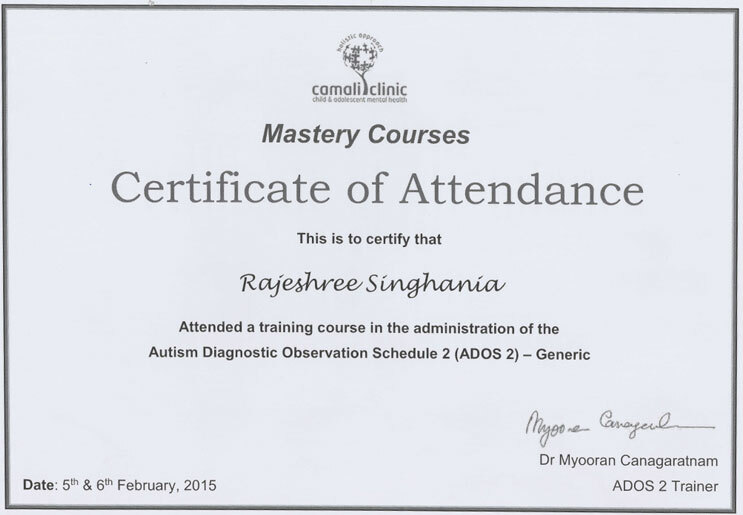 I have done the ADOS-2 training course twice. The first one in Dubai and the second one in London at the Great Ormond Street Hospital. It included lectures, live administrations, group discussions, a course manual and clinical practice. Following the ADOS-2 training course, we were required to complete a series of post-course work. Course work was marked by the trainers to certify a level of clinical competence. To obtain a certificate we had to give practical exam and achieve more than 80 %. The certificate allows me to conduct unsupervised clinical ADOS-2 assessments.